Emily Henry’s Pueblo Plum Blossom design — a hand-carved spray of delicate branches — has become a mainstay of the designer’s modern Millicent furniture line. Photo by Peter Vitale. When Emily Henry finished high school, she fled her hometown of Taos, New Mexico, as quickly as she could, intending to never look back. After growing up the daughter of an architect and an artist on Dennis Hopper’s Rainbow Commune near Taos, Henry set out in search of a more “ordinary” life. “Taos in the 1970s was certainly a moment in time that a lot of people fantasize about, and I was lucky enough to experience it, but being a kid during that time wasn’t always ideal,” she says. But the gravitational pull of her hometown was strong. About five years ago, on a bit of a whim, Henry designed a series of sleek cabinets in a light, textured poplar wood for a client’s estate, and when the client “flipped out in a good way, I knew I was on to something,” she says. The Pueblo Plum Blossom design, which features branch-like sketches carved onto otherwise clean lines, has become a mainstay in Henry’s collection. 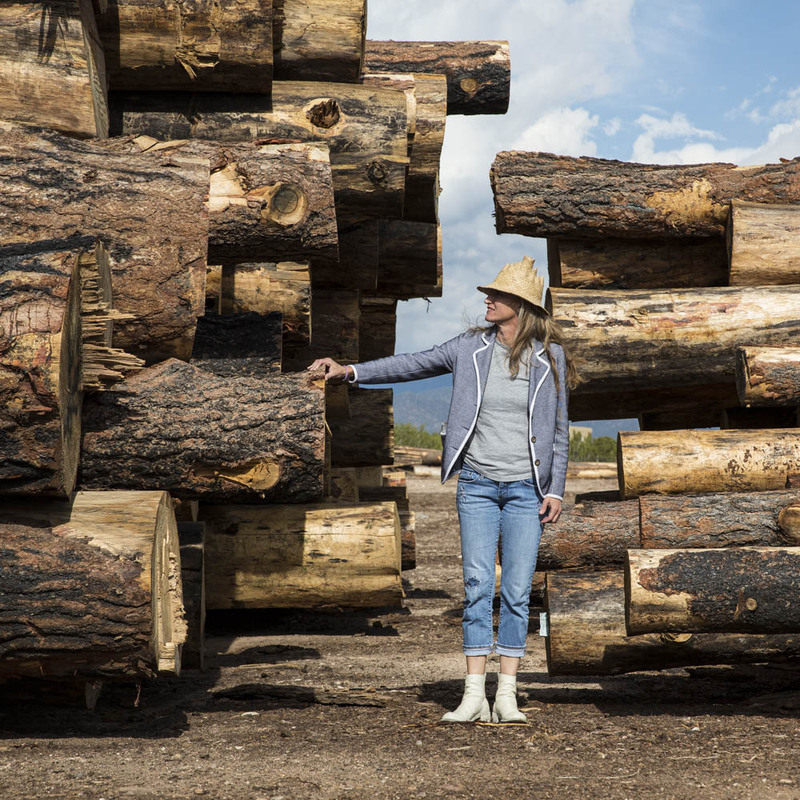 After four years of creating custom pieces, in 2015 Henry officially launched Millicent, a small collection of wooden furniture made in Taos and Santa Fe. It wasn’t an easy undertaking — each piece is made from heirloom-quality poplar, pine or walnut, and includes a hand-carved relief pattern on the exterior. The doors are fitted with leather pulls or brass accents that open to a sky-blue interior, a subtle nod to the clear skies of Taos. Production takes up to 200 hours per piece, and trying to determine how to make the designs consistent but not mass-produced was a challenge, Henry says. Henry inspecting the raw materials. Photo by Jen Judge. Design for Life // Get to know New Mexico through a native’s eyes. Click here to see Emily Henry’s favorite haunts, shops and eats.